Estuaries are special places along our coastline. Wallagoot Lake estuary is home to many weird and wonderful creatures. 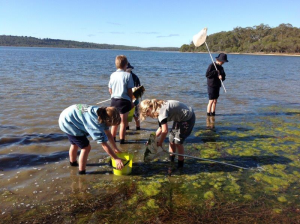 Students will be equipped with dip nets and reef boots and will set out to explore this dynamic environment. Students collect a variety of living things and then sort through the specimens found, grouping the same species. Students classify into plant and animal groupings and investigate the collected live specimens. Once completed they continue their survey with a beach investigation examining the treasures of the tideline! Students discuss ways to protect the biodiversity they have discovered.